THESE BLUES—ultramarine and azurite—so important to the medieval and Renaissance painter, often cannot be even tentatively differentiated by the naked eye when sampling and identification by microscopy are unavailable. Frequently they have been altered chromatically and even chemically by natural means or by human intervention. 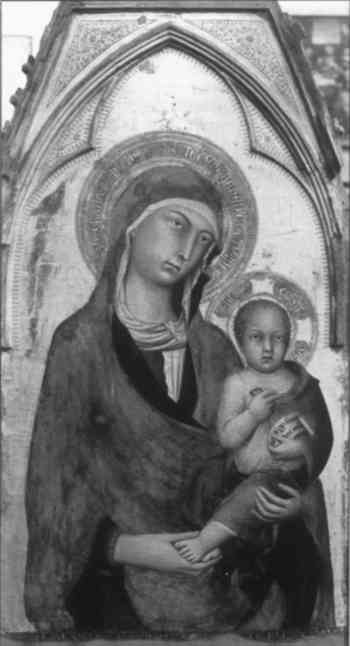 In many early Italian panels the Virgin's mantle has become very dark, almost black, and has a flat, opaque appearance. Any evidence of modeling is lost. For instance, the azurite mantle of the Virgin in Duccio's Rucellai Madonna (Uffizi, Florence, 1285) appeared dark with little trace of modeling, before the recent cleaning, as the Virgin's mantle in Simone Martini's 1333 Annunciation (Uffizi, Florence) does still. If azurite is present the blackening is usually the result of a darkened oil or resin varnish—a varnish which has darkened due to chemical processes occuring within the film—trapped between the large particles of the pigment. It is virtually impossible to leach out these varnishes, and attempts in the past using strong alkalis have only contributed to the darkening. On the other hand, old varnish films can give ultramarines a greenish quality. In other rare instances ultramarines look gray and grainy, perhaps due to the use, in past restorations, of acids, which decompose the pigment and result in color loss (Gettens and Stout 1966). One must be careful in distinguishing these ruined ultramarines from the deliberate use of the gray, low-grade form of the pigment, ultramarine ash. Chemical changes can also alter the color of blues. One change quite frequently found in the blue skies of medieval frescoes is the transformation of azurite into its green relative malachite, a change occasioned by the presence of water seeping through the walls and condensing on the wall surfaces (Mora et al., 1984, 66). Occasionally in mural decorations, the alteration of portions of azurite blue skies to the green basic copper chloride, paratacamite, in the presence of sodium chloride through contact with the chloride ion, has also been discovered (Gettens and Stout 1958). Hence, it is often difficult to distinguish ultramarine and azurite with the naked eye based on a prior knowledge of how each color should look. And although the two pigments can be identified quite easily by chemical or microscopic means, this information is not always available from restoration or conservation laboratories in larger museums around the world, since many paintings have never been technically examined or sampled. Yet some photographic techniques are widely available, one of which has been in use since the early 1930s. The first of these is the use of black-and-white infrared film, which can be obtained in formats of 35mm or 4 × 5 negative sizes from most photographic stores. Strong incandescent illumination or natural light emit sufficient quantities of infrared rays to irradiate pigments in a painting, and when combined with a yellow filter placed in front of the lens of the camera, the unequal infrared reflective properties of the various pigments are recorded. Marie Farnsworth in the 1930s was the first to experiment with the new film by recording the effects on known pigments. She found that azurite absorbed infrared light by appearing black on a positive print, whereas ultramarine blue reflected infrared rays and appeared light (Farnsworth 1938). This striking difference was immediately recognized by art conservators as a simple means of distinguishing the two pigments photographically, and soon thereafter experiments with the film made their way into the literature. Then, in the early 1960s, color infrared film, which had been developed initially by the Eastman Kodak Company for the military to detect enemy camouflage, became commercially available. Whereas black-and-white infrared film has a slow emulsion speed and, therefore, requires strong auxiliary lighting, color infrared is much easier to work with. 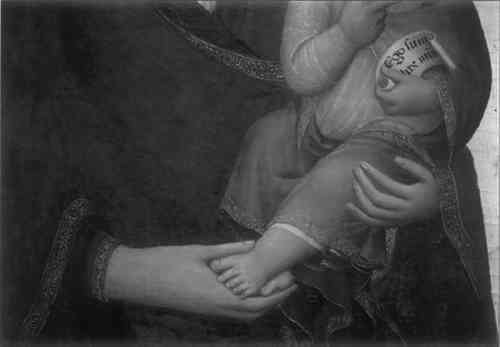 It can be used in daylight or with flash, making it possible to take this kind of photograph in many European galleries and churches. Like black-and-white infrared, color infrared film records the absorption or reflectance of infrared radiation characteristic of each pigment, but it does so in terms of color contrasts. Each pigment is recorded as a different and often distinct color, hence the characterization of this film as a “false color film.” Ultramarine blue appears cherry red, while azurite appears bluish. The reds are less easy to tell apart because vermilion is pale yellow and red lake is also yellow but a deeper shade (Olin and Carter 1970; Matteini et al., 1980; Matteini and Moles 1986, 189–93). For example, in a color infrared detail from Simone Martini's Orvieto Polyptych (Museo dell'Opera del Duomo, Orvieto, ca. 1320–23), the Virgin's ultramarine mantle shows up as red except for a small area of restoration that appears blue, indicating that the restorer used azurite. The red lake wrap of the Christ Child appears as yellow, and the Virgin's dress appears orange, suggesting that it consists of a mixture of red lake (yellow) and ultramarine (red) (figs. 1–3). Color infrared film has important applications for the study of early Italian painting, as it enables the researcher to distinguish clearly when azurite or ultramarine were being used, an important distinction given the widely different values of the pigments on the contemporary market. 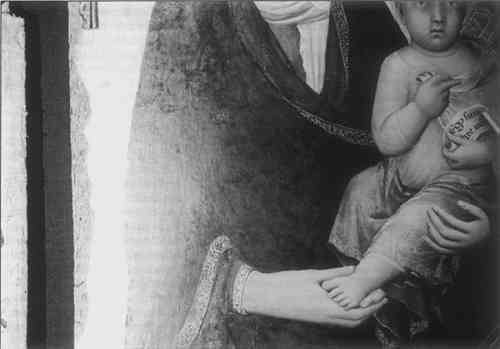 For this study the photographic technique has been employed for the examination of a number of early Sienese panels in European collections. In the following discussion all determinations of blue pigments have been made, unless otherwise indicated, by the author using the technique of color infrared photography.